1. A Woman in a Juste of grey taffeta, with a pink corset, and a matching ribbon on the front, on top of the corset. On her chest is a full kerchief of white linen-gauze. Her hair is styled in large curls all over her head, and two of these curls fall on her chest. Behind, her hair hangs à la Conseillère. Her hair is surmounted with a pouf of white gauze, trimmed with a pink ribbon with stripes, and a veil falling behind. 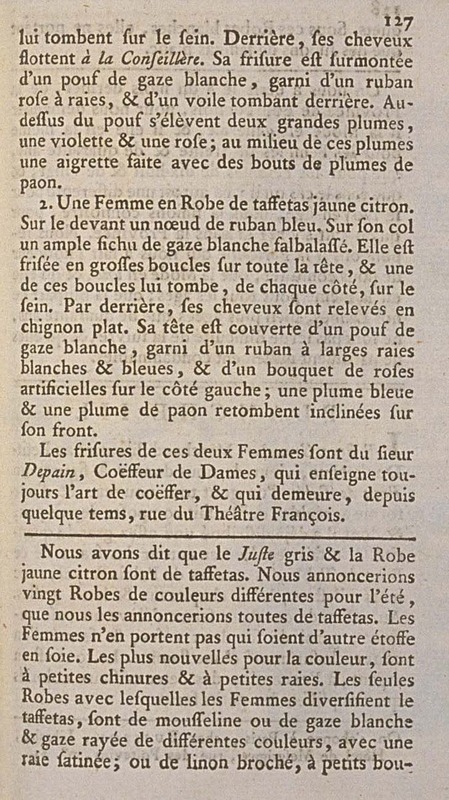 Above the pouf rise two large plumes, one purple and one pink; in the middle of these plumes is an aigrette made with the ends of peacock feathers. 2. A Woman in a Gown of lemon yellow taffeta. On the front is a bow of blue ribbon. On her chest is a full kerchief of flounced white gauze. Her hair is styled in large curls all over her head, and one of these curls falls, on each side, on her chest. Behind, her hair is pulled up in a flat chignon. Her head is covered with a pouf of white gauze, trimmed with a ribbon with wide white and blue stripes, and a bouquet of artificial roses on the left side; a blue plume and a peacock plume fall at an angle over her forehead. 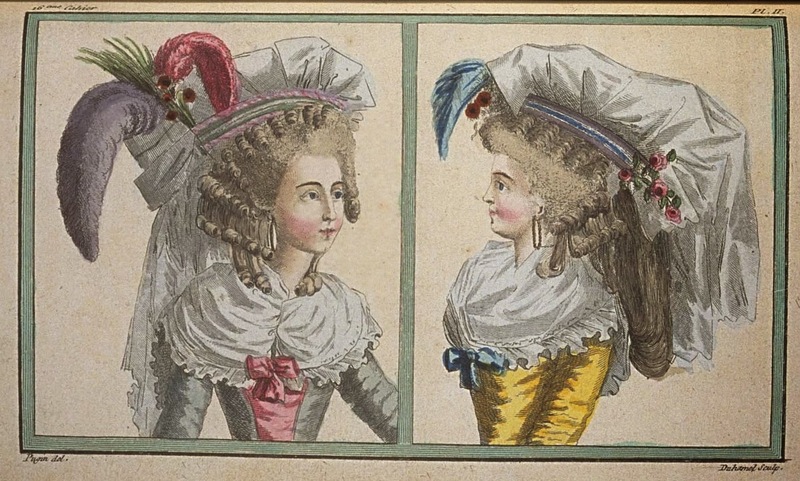 These two Women's hairstyles are by M. Depain, Ladies' Coiffeur, who always teaches the art of hairstyling, and who resides, since some time ago, in the rue du Théâtre François. We have said that the grey Juste and the lemon yellow Gown are of taffeta. We would announce twenty Gown of different colors of summer, and we would announce them all of taffeta. Women do not wear gowns which are of another silk fabric. The newest in terms of color, have little chiné designs and little stripes. The only Gowns with which Women vary from taffeta, are of muslin or white gauze and gauze striped with different colors, with a satin stripe; or of brocaded linen, with little bouquets. Under these white Gowns, they only wear Petticoats of white taffeta. 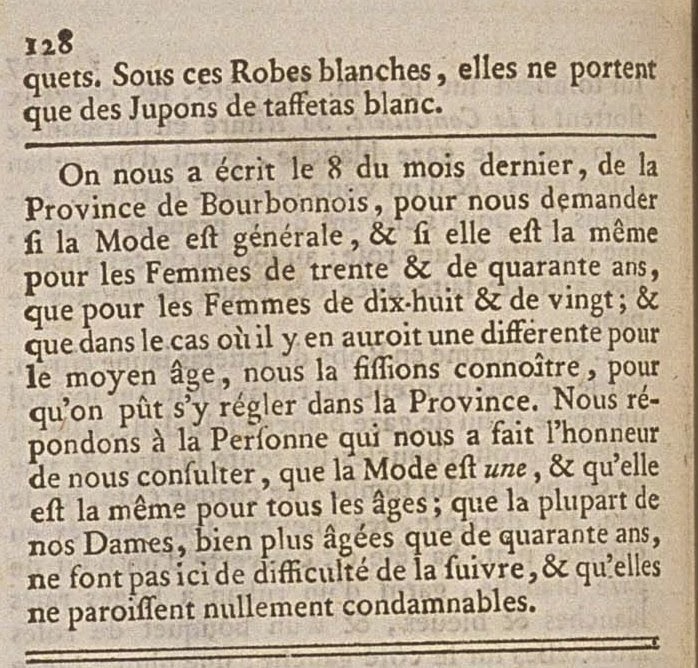 It was written to us on the 8th of the last month, from the Province of Bourbonnais, to ask us if Fashion is general, and if it is the same for Women of thirty and forty years, as for Women of eighteen and twenty; and in the cases where there would be a difference for middle age, we would make it known to her, so that it could be settled in the Province. We respond to the Person who made us the honor of consulting us, that Fashion is one, and that it is the same for all ages; that the majority of our Women, much more than forty years old, do not have difficulty in following it, and that they never appear reprehensible.